E.K. Fernandez crew members were busy yesterday setting up rides at Kakaako Gateway Park for next weekend's Kakaako Carnival and Food Festival. 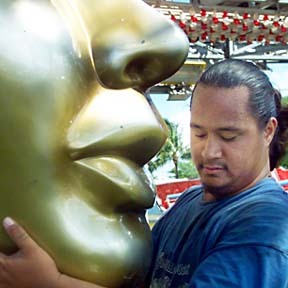 Felipe Kuehu looked like he was getting a giant kiss while assembling the Pharaoh's Fury carnival ride. For more information on the carnival, a benefit for the Hawaii Children's Discovery Center, visit www.ekfernandez.com/fair_carnival04.html.